It has been quite a while since we last posted about the trade show industry, so it is nice to find an intriguing story covering this often critical promotional matter. 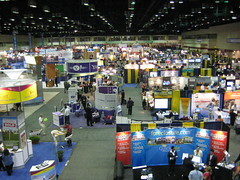 For many companies, attendance at trade shows represents their most expensive outlay of promotional funds. This is because trade show exhibitors are often confronted with many potential costs including: designing and building an exhibit; shipping the exhibit to the show site; rental fee for space at a trade show; and exhibit installation and setup. Of course, a company also needs to pay for employee travel, hotel accommodations, food and salaries. Because trade shows are one of the most expensive forms of promotion, marketers should be on the lookout for ways to cut costs without impacting the effectiveness of an exhibit. This story from Exhibitor Magazine is a good place to look for cost-cutting ideas. The story offers 25 ways to reduce trade show costs. A good portion of the suggested savings is directed at the exhibit space, including ideas for reducing the cost of acquiring space and ways to save on signage appearing in the space. But there are many other ideas for realizing savings including those directed at transporting, installing and servicing an exhibit, and managing employee expenses.